November 11 is the anniversary of the death of "Typhoid Mary" Mallon in 1939. When wheezing and sneezing employees show up for work instead of taking an allotted sick day, they are often called a Typhoid Mary—invoking the dead and virulent namesake of hash- and fever-slinging Mary Mallon. Like many unintentional bacterial gifts, typhoid fever is spread through the intake of food or water contaminated with infected feces (see also Maginot Line). While not typically fatal, it nevertheless plagues its victims with fever, sweating, diarrhea, and furious anger at whoever did not wash up after using the bathroom. The height of its mortality rate in the United States was in the late nineteenth century, just around the time Mary Mallon immigrated to the United States from Ireland. 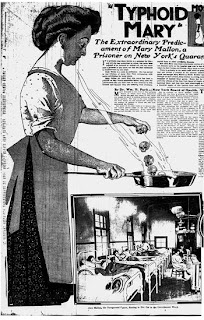 Mallon was born in 1869, sought her fortune in the New World in 1884, and was well established as a cook in New York City by the turn of the century. However, when members of one of the families who hired her unexpectedly contracted typhoid, they hired civil engineer and typhoid research George Soper to investigate. Soper soon discovered that Mallon had sped through seven jobs between 1900 and 1907, leaving a wake of twenty-two typhoid cases and at least one death. Though a complete stranger to her, Soper approached Mallon, suggested she might have typhoid, and requested stool, urine, and blood samples. The Irish cook refused, and the rest is history. Tensions escalated. Mallon herself did not feel or appear sick and was convinced she was being unfairly targeted as a working-class Irish woman. Soper, meanwhile, returned to question Mallon again, this time with a doctor, followed eventually by a New York City health inspector. Mallon refused them all. She was finally arrested, found to be a carrier for typhoid, and placed in isolation for three years by the board of health. Though Mallon was eventually released with the agreement that she would no longer work as a cook, she soon discovered that work as a laundress or other house servant paid comparatively little, so she assumed a fake name and took a job cooking again in New York’s Sloane Hospital for Women. While there, Mallon passed along her special sauce to twenty-five more unwitting victims, one of whom died. Mallon’s identity was eventually discovered, and she was arrested and quarantined again on North Brother Island. By this point, Mallon was known to have infected fifty-three people total (three of whom died) and was referred to publicly as “Typhoid Mary.” Sympathy for her cause had evaporated, and she would spend the rest of her life under quarantine, suffer a paralyzing stroke, and ultimately die six years later of pneumonia in 1938 at the age of sixty-nine. It has since been theorized that Mallon might have contracted typhoid from her mother before she was born and simply never experienced any symptoms. Though she protested her innocence to the end, an autopsy indicated that Typhoid Mary was still harboring live bacteria in her gallbladder when she died.